In Memoriam - Northern Prosthetics & Orthopedic Inc.
Craig graduated from Rock Valley College in 1988 with an Associates Degree in Business Administration. He attended Northwestern University Graduate Program in Prosthetics in 1989. Craig was licensed in the State of Illinois, certified by the American Board for Certification and was a Fellow of the American Academy of Orthotists and Prosthetists. He was also a member of the American Orthotic and Prosthetic Association. 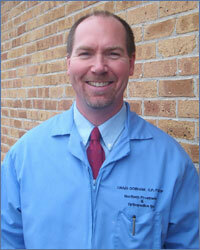 Craig began his employment at Northern Prosthetics and Orthopedic Inc. in 1983. He greatly enjoyed working with his patients, and giving them mobility and independence. He is greatly missed by all.